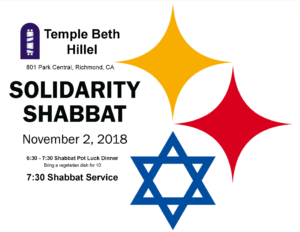 This Shabbat has been designated as Solidarity Shabbat with the Jews of Pittsburgh. Congregations across the country, of every denomination, are coming together in Jewish unity and in support of the Tree of Life Synagogue and the Pittsburgh Jewish community. At times like this it is natural to feel afraid and alone. That is why we need each other; why we need community. Let’s come together to support each other, to stand for the Jewish people, and to show that we will not be intimidated by hate. We will respond to hate with love, to division with community and with the Jewish values of love of the stranger, compassion for all human beings, and continuing to work to fulfill the Divine vision of a world where all human beings can live in dignity. Our Torah is a Tree of Life to all who hold on to it. We will not abandon it. This Friday evening we will have a community potluck dinner at 6:30 PM. If you would like to join us please bring a vegetarian dish for six. Services will begin at 7:30 PM. During the service we will have a special memorial for the victims of the attack at the Tree of Life Synagogue.